Today is National Chocolate Covered Anything Day. Consider buying that special person in your life a tasty chocolatey snack, or perhaps yourself. I'd prefer a chocolatey imperial stout myself. 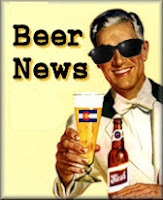 Here's what's happening around the Colorado beerosphere today Friday, December 16th, 2011. Crooked Stave (Fort Collins/Denver) - Owner and brewer Chad Yakobson announced yesterday that he will begin selling Cellar Reserve memberships for $300 starting on December 17th, 2011 at 10am on their website: membership.crookedstave.com. Membership is good for a year and entitles you to several members only bottles, a membership card, an exclusive membership t-shirt and rights to buy additional Cellar Reserve releases. Read all the details here. Arvada Beer Company (Arvada) is hosting a Renovator tapping party at 5pm today. Party pigs are also available and can be filled with Wheat, IPA, Brown or Porter. Gift certificates are available as well as Beer for a Year (a growler a month for 12 months). Come on down today. They are open from 11 am to 11 pm today. Phantom Canyon Brewing (Colorado Springs) has a new beer on tap: Dinsdale Piranha Winter Ale. A light brown English-style ale that is often referred to as a "winter warmer", our Dinsdale Piranha Winter Ale is a hoppier version of this traditional English ale. It has roasty hints and fruity aromas that give way to flavors of earthy hops and mineral dryness. It's a medium to light bodied beer with a nice balance and lingering bitterness. Served in a pint glass. 6.1% ABV. If you were on their email list - you'd have a coupon for a FREE BEER today from 3pm to 6pm. Crabtree Brewing (Greeley) - Stop by the brewery tonight and take advantage of the food cart from Padre Poll's Holy Smoke Barbecue that will be parked outside. Enjoy a brew or two and some wonderful pulled pork bbq sandwiches, or Boxcar Brown Brats or even some cheddar soup. Try one of Crabtree's new Brewer's Reserve beers: the Cranberry Dunkelweizen and the Raspberry Saison. Also check out their Santa Fe Roots Energy Tonic (non-alcoholic). Great Divide Brewing (Denver) - Pizza and Beer - heck ya. The Basic Kneads Pizza food truck will be at Great Divide today from 4:30pm to 9pm. Grab some 'za and wash it down with a tasty GDBC brew. Twisted Pine Brewing (Boulder) - A reminder - Twisted Pine will be closing early Saturday, December 17th at 6pm and on Sunday, December 18th at 7pm, for a holiday parties. They apologize for any inconvenience and appreciate your understanding! Growler Day (December 17th) - Breweries in Fort Collins have their plans in place for #growlerday tomorrow. According to a Coloradoan article, Odell Brewing will offer anyone who joins their Jug Club a free glass growler. New Belgium will offer $1 off growler refills and an extra sticker with each fill. Fort Collins Brewery limited release FCB sihpons are $5 off for $30, including a fill. Pateros Creek will give you $2 off new growlers and refills. Grimm Brothers (Loveland) is having a custom growler contest. Avery Brewing Company (Boulder) - Anybody want a free keg? Starting TODAY, Avery Brewing Company is hosting a food drive along with Conscious Alliance to benefit Boulder Community Food Share! This wonderful organization is running extremely low on the following items: Pasta Sauce, Peanut Butter, Tuna, Canned Fruit, Cold & Hot Cereal, and 100% Fruit Juice. For every 2 items of these six you donate, Avery will give you 1 raffle ticket towards a free keg. There is no limit on the amount of raffle tickets you can accumulate. The more donated food the merrier! Swing by the Avery Tap Room to donate and grab a pint! The food drive runs through December 30. Like what you see here? There's even more Colorado beer happenings on the Fermentedly Challenged Facebook page. Help us grow to 500 "Likes" by year's end! We're getting closer with just over 2 weeks left.